People say that there is no such thing as perfection but, you know otherwise. You are perfection and maybe the only living thing that can say that. From head to toe you are the epitome of the perfection. Someone looks up the definition of perfection in the dictionary and they just see a picture of you there. 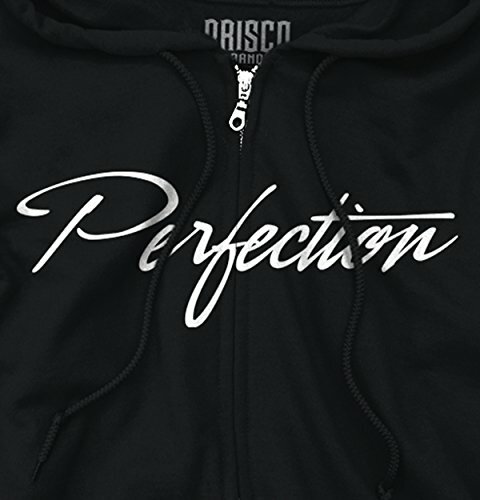 Show all the poor saps that don't believe perfection exists with this Zipper Hoodie. Maybe they will finally realize that there is only one thing in this world that is perfect and you are it. As if they didn't already know just by looking at you. Classic Teaze products are proudly manufactured in North Carolina. We are NOT responsible for counterfeit product sold by unauthorized sellers. SIZES (Chest/Length): -Small 19.25"/27" -Medium 21.25"/28 -Large 23.25"/29 -XL 25.25"/30 -2XL 27.25"/31 -3XLarge 29.25"/32 -4XL 31.25"/33" -5XLarge 32.25"/34" FABRIC: 8.0 oz, 50/50 cotton polyester preshrunk fleece knit Proudly designed and printed in the USA, we offer a wide variety of apparel, using new-age technology and eco-friendly inks. We love what we do and we strive for customer satisfaction! Air jet yarn for softer feel & reduced pilling, Machine wash warm, inside out, with like colors. Only non-chlorine bleach. Tumble dry medium. Do not iron or dry clean. (Print may appear smaller on bigger sizes. Image tones vary by screens used) Your attitude is what makes you who you are. Your sense of humor makes you only slightly less funny than a professional comedian. We created our funny clothing to attract even the wittiest and hilarious men to show off their humor.